DWTS13 End-of-Season Award Winners – Who Was the Cutest Kid in the Audience? Courtney: First of all, some clarification – this was not meant to be a mean-spirited question, and I think some of you kind of assumed it was, based on some of your write-in responses. I just found it interesting that this was a season where the “shot of somebody’s kid in the audience” played a bigger role than ever before – I can’t recall a previous season where we were constantly bombarded with cute, clapping, gap-toothed grinning kiddie faces week after week, and we even discussed the fact that TPTB may be rather invested in whose faces we see each week – hence the “boost” they may have been giving David. Really & truly though, I agree with the majority – I got the biggest kick out of seeing Coco’s little bashful, excited face each week after her daddy’s dances. She really is a mini-David, with some of the faces she pulls! I just loved that she seemed so happy to be there, and so proud of her daddy after every dance, whether he knocked it out of the park or failed miserably. Mason was also cute in his few appearances – I got a kick out of seeing him dressed as an Indian during Halloween week, and during the non-dress up weeks, I just thought it was cute how he clapped more out of mimicry of the rest of the audience, rather than actual comprehension of what was going on around him 😛 Nancy’s twins were fun in that they seemed like polar opposites – John David seemed like the sweet, affectionate one, waving to the camera, smiling and blowing kisses; I think a lot of us agreed that Lucy seemed like the handful, often pouting and scowling in pictures and refusing to cooperate. Nancy’s gonna have fun with those two! 😀 I think I only caught a short glimpse of Hope’s nephew in his costume, but he was cute too 🙂 And I can only recall Ricki’s sons showing up once, and they’re a bit older, so they were pretty tame, just clapping politely and smiling rather than doing anything generally considered “cute”. Vogue: Courtney, I didn’t think this was a mean spirited question. I thought it was a fun one especially being the camera showed the celebrities kids and family so much last Season. All the kids were so cute. I voted for Coco being her heart was so much into the whole show. She was clapping nonstop! 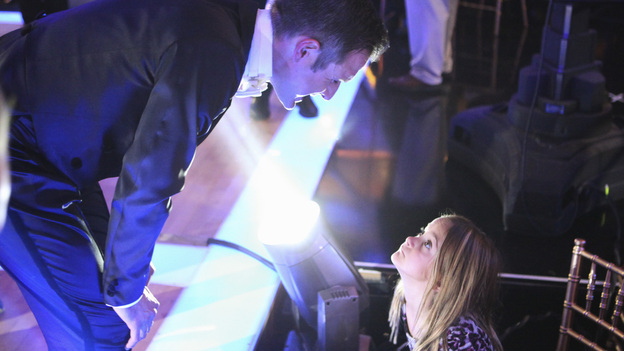 You could tell she loved being in the audience and her love for her Dad was so apparent. Nancy’s kids caught my eye too…but, boy oh boy, I imagine they are a handful…..much like SHE is. LOL! !